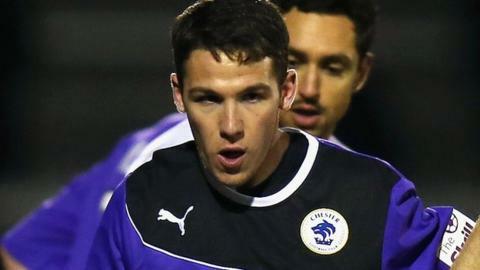 John Rooney struck his first goal of the season as Chester claimed all three points in the Cheshire derby against former landlords Macclesfield Town. The younger brother of England captain Wayne Rooney struck the only goal with a stunning 13th-minute free-kick after Luke Waterfall's foul on Craig Hobson. Danny Harrison blew hopes of a second, firing wide before Macc keeper Rhys Taylor saved Hobson's 35-yard chip. It was a first defeat of the season for Macclesfield, who slip to 12th. Their best chance came and went when home keeper Jon Worsnop did well to keep out former Chester striker Chris Holroyd's far-post effort. After a poor start to the campaign, Chester have now climbed three points clear of the Conference drop zone. Rooney's match-winner, against the club where he started his career, was also particularly satisfying for City boss Steve Burr, who enjoyed a prolific eight seasons with Macclesfield in his own playing days. Versatile midfielder Callum Morris, who joined Chester from Tranmere in midweek, was an unused substitute for the home side. Match ends, Chester FC 1, Macclesfield Town 0. Second Half ends, Chester FC 1, Macclesfield Town 0. Foul by Will Haining (Macclesfield Town). Kingsley James (Chester FC) wins a free kick. Offside, Chester FC. Craig Hobson tries a through ball, but Craig Hobson is caught offside. Attempt missed. Kingsley James (Chester FC) header from the right side of the box is too high. Assisted by John Rooney with a cross. Substitution, Macclesfield Town. Will Haining replaces Domaine Rouse. Foul by George Pilkington (Macclesfield Town). Luke Waterfall (Macclesfield Town) is shown the yellow card for a bad foul. Foul by Luke Waterfall (Macclesfield Town). Attempt saved. Chris Holroyd (Macclesfield Town) right footed shot from the right side of the box is saved. Foul by Craig Hobson (Chester FC). Attempt saved. Craig Hobson (Chester FC) left footed shot from outside the box is saved. Hand ball by Chris Holroyd (Macclesfield Town). Attempt missed. Ben Heneghan (Chester FC) header from the left side of the six yard box is too high. Kieran Charnock (Chester FC) wins a free kick. Substitution, Chester FC. Craig Mahon replaces Jadan Hall. Attempt saved. Paul Turnbull (Macclesfield Town) left footed shot from more than 35 yards is saved. Attempt missed. Scott Barrow (Macclesfield Town) right footed shot from outside the box misses to the left. Scott Barrow (Macclesfield Town) is shown the yellow card for a bad foul. Foul by Scott Barrow (Macclesfield Town). Sean McConville (Chester FC) wins a free kick. Offside, Chester FC. Kingsley James tries a through ball, but Kingsley James is caught offside. Domaine Rouse (Macclesfield Town) wins a free kick. Foul by Arthur Gnahoua (Macclesfield Town).